grays to match the old cedar post. Linking with Theresa at Run Around Ranch. Good idea to go back and check! I like the new fence boards but prefer the weathered look of the old. 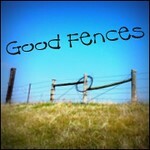 always fence repairs/replacements to be done. nice comparison shot. If you live here long enough, you will find anything is possible in Texas. Meggie, I've seen two or three old churches lately and thought of you. One of these days I will have my camera and get pictures. I love your fence pictures too. I like the old wood, new wood, and stone combo! If you remember, post the photo a year from now....and if you remember, remind me to come visit. I have been back to blogging about a week or so...and still not getting to everyone. Quite the contrast between the old and the new. The pillar between both sets them off nicely. I like the brick post that joins the fences.